CAPTAIN COOK, Hawaii » Resident Linda Bong described the "fabulous" scene that followed the brief hailstorm that blanketed parts of South Kona with pea-size pieces of ice yesterday morning. "It looked like diamonds everywhere," she said. But it made her nervous while it was happening, with strong winds blowing the ice particles nearly horizontally, shooting them across her lanai and embedding them in the screens on her windows. Hail was reported yesterday in several Big Island communities. A mile from Captain Cook, in Kealakekua, hailstones the size of quarters were reported, according to the National Weather Service. The hail was a product of a strong thunderstorm cell that formed over the Big Island, said Brad Fujii, Weather Service forecaster. Hawaii County Civil Defense said no homeowners reported damage, but high winds knocked down electric lines and television cables during the 9:30 a.m. event and some areas remained without service at nightfall. 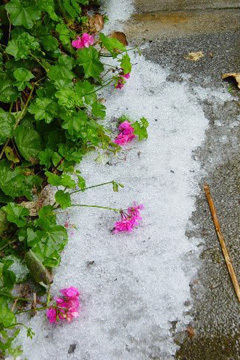 About 200 customers were affected, according to Hawaii Electric Light Co.
Pea-size hail rattled areas of Captain Cook, South Kona, yesterday, leaving drifts like this one among Nelson Stringer's geraniums. Bong's neighbor Nelson Stringer said the hail came down so hard, moments after rain, that it overflowed his gutters and gathered in piles at the base of downspouts. There was white all over the lawn, and some of the piles of ice had not yet melted six hours later, he said. The unusual event was preceded Thursday night by a thunder and lightning storm out to sea in the direction of Maui, Bong said. "Everybody watched the light show all night," she said. Although they did not know it at the time, that was the area where a small tornado touched down on Lanai at about 9:35 p.m., causing limited damage. By daybreak, Kona weather seemed normal, but at about 9:30 a.m. a sudden dark cloud formed. Residents found themselves in a swirling fog, and winds pushed rain and hail nearly horizontal, Stringer said. "In 20 minutes the whole thing was over," Bong noted. Yesterday at about 4:25 p.m., a replay happened on the other side of the island in Puna. The National Weather Service said hailstones the size of nickels fell near Mountain View, south of Hilo. Civil Defense official Neil Gyotoku said the hail fell briefly in the Hawaiian Acres subdivision without causing damage. "It seems to have moved real fast," he said.